This is the antsy time of year. Let’s scratch our itch to spend more of our time out of the house and less of it in the kitchen with this easy, healthy recipe for from-scratch King Ranch Chicken! 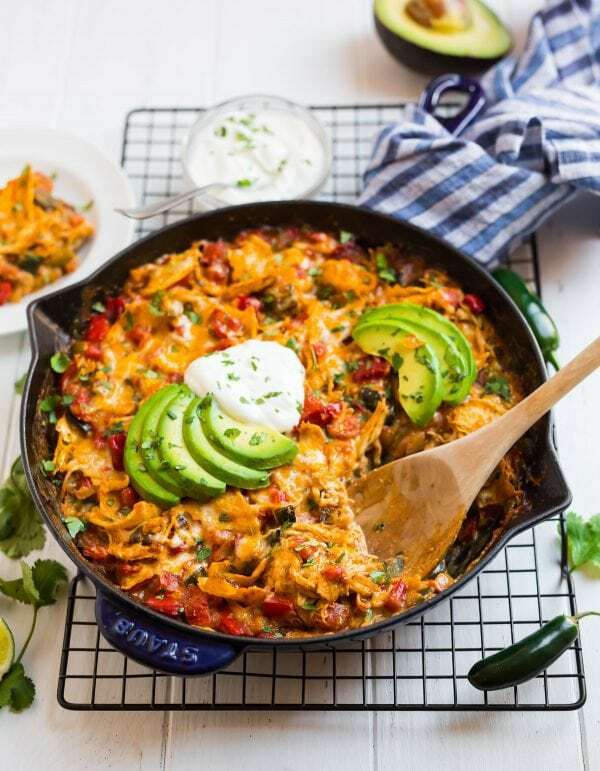 An all-in-one meal that will leave you with just one pan to wash in the end, this sped-up skillet version of classic King Ranch chicken casserole offers lean protein, fresh veggies, and Tex-Mex style comfort. Hustle, and this recipe is ready in 30 minutes. Use that free time to go for a longer walk, stay for one more round of patio drinks (a Skinny Margarita perhaps? ), or just do what I’ve been doing and turn your face up to the sky and relish the sun. Now that warmer weather has (finally!) arrived, I can hardly sit still. Fast, healthy dinners are on the move, especially if they taste great reheated. Your future self will thank you for cooking this tonight when you’re enjoying the leftovers tomorrow. If you live anywhere in the Midwest, you know I’m ahead of myself here. The month of April tends to be a heartbreaker, so I’m sure that Mother Nature has a few cold snaps still in store. 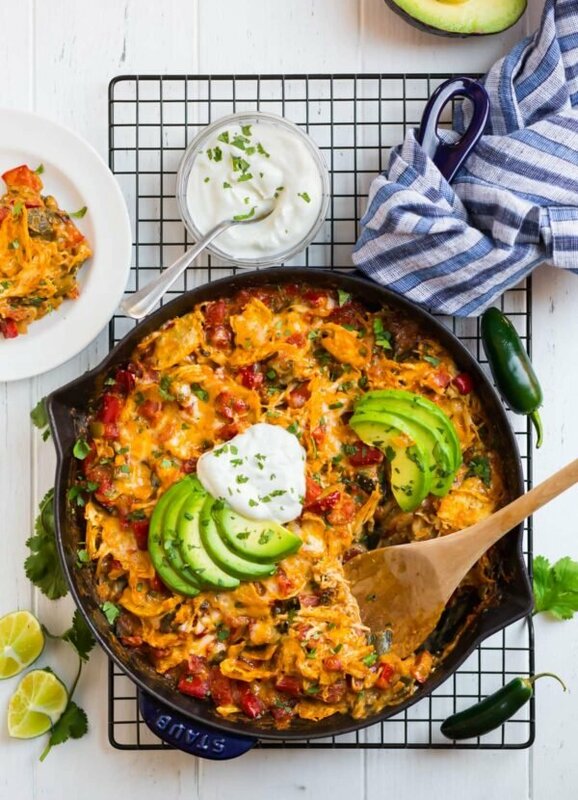 This King Ranch Chicken casserole recipe suits me then too. With its layers of gooey cheese, tortillas, and hearty chicken all bathing in a velvety, creamy sauce, it’s comforting enough to soothe my cold-weather-weary soul right into spring. Add the ease/deliciousness factor, and I fully anticipate to still be cooking it this summer and on into fall too! So, What Is King Ranch Chicken? I first heard about King Ranch Chicken on an episode of The Pioneer Woman. It’s a Tex-Mex casserole that layers corn or flour tortillas with cheese, chicken, diced tomatoes, spices, more cheese, cream of this, and cream of that. 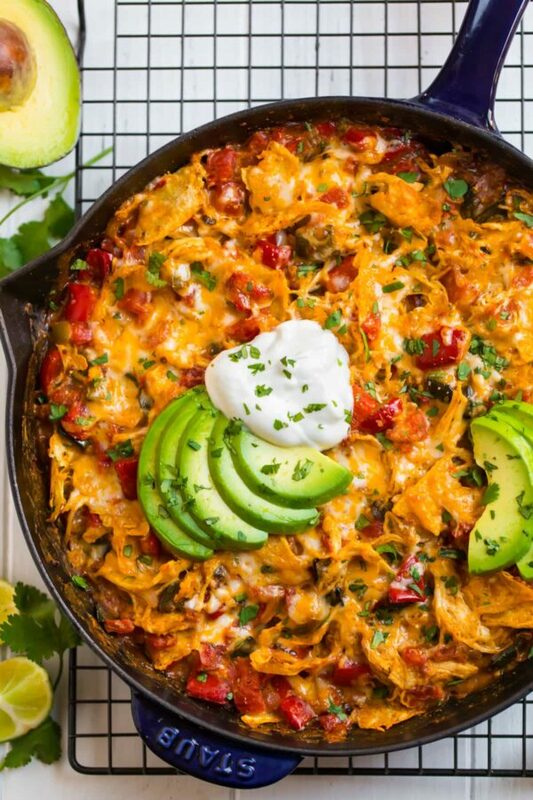 It was like an enchilada, pan of nachos, and your grandma’s best casserole classics rolled into one and baked to gooey bliss. The name “King Ranch Chicken” allegedly hails from King Ranch, which is a large ranch in Texas. The recipe and the ranch don’t seem to have any actual connection to each other (at least not one that I can find), but I feel like if I showed up at King Ranch with a big pan of it, they might let me in the front door. 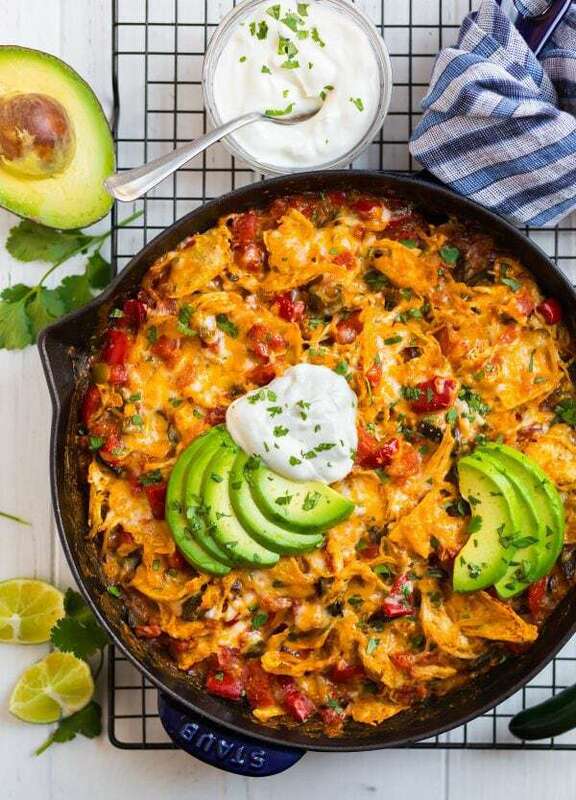 Honestly, the more I read about King Ranch Chicken, the more it reminded me of my Chicken Tortilla Casserole, but with the creaminess factor dialed waaaaaaaay up. And the more I read, the more I knew I had to create a healthy version of it. With it comes a deep affinity for taking recipes that are traditionally heavy on the processed “cream of” soups and making them from scratch instead. I also adore finding ways to make true comfort foods like King Ranch Chicken better for you while staying true to their cozy roots. To keep the casserole creamy, I used a moderate amount of reduced-fat cream cheese in the sauce. Just two ounces was all I needed to eliminate the canned soup entirely, and the resulting casserole was gratifyingly rich. To make the casserole healthy, I loaded it with lots of fresh veggies. Instead of sour cream, we topped our servings with nonfat Greek yogurt and big slices of fresh avocado. My other major departure with traditional King Ranch chicken casserole was to cook the entire recipe in a skillet that I popped under the broiler to melt the cheese at the end, instead of layering everything in a baking dish. The skillet approach cuts the cook time in half and reduces dishes too! The name “King Ranch Chicken” might not have anything to do with the monarchy, but feasting on it certainly made me feel like a queen. Try the recipe, and you’ll feel like kitchen royalty too! Healthy King Ranch Chicken from scratch. Just as creamy and comforting as the Tex-Mex original, lightened up with every day ingredients. Ready in 30 min! Place a rack in the upper third of the oven (usually the second-most slot from the top) and preheat the oven to broil. In a medium ovenproof skillet, heat the oil over medium-high heat until hot but not yet smoking. Add the bell pepper, onion, poblano and jalapeño. Cook, stirring occasionally, until the vegetables are softened, about 8 to 9 minutes. Add the garlic, chili powder, cumin, and salt and stir constantly. Continue cooking and stirring until fragrant, about 1 minute. Sprinkle the flour over the vegetables and cook, still stirring constantly, until they are thoroughly coated and the white bits of flour disappear, about 1 minute. Stir in the broth and bring to a boil. Stir and cook until the mixture is somewhat thickened, about 3 minutes. Reduce the heat to low. Break the cream cheese into the skillet in bits. Stir until melted. Gently stir in the chicken, diced tomatoes, torn tortillas, and half of the cheese. Sprinkle the remaining cheese over the top. Place the skillet under the broiler. Broil until the cheese is melted and browned, about 1 to 2 minutes—do not walk away and watch the skillet the entire time to make sure it doesn’t burn. Sprinkle with cilantro. Serve hot with a dollop of Greek yogurt. Literally saw this post as I was walking into the grocery store. Guess what I’m making for dinner now?! I hope you love it, Christina! Omg this is such a drool-worthy chicken dish!! I am so hungry now!! Oh, I so want to try this. Do you think I could use tortilla chips instead of the corn tortillas? It’s a consistency thing for me. Hi Jennifer! Once they are baked in the casserole, the texture of the tortillas changes—they break down and are part of what helps to thicken it up. You could use chips, but they will turn soggy and not stay crisp. The decision is really up to you based on what you think you would enjoy more. I hope you love the recipe! Ah, yes, I see. Soggy is not what we’re after. I will try the corn tortillas. Thanks for your quick response. I’m making this recipe this week! I’ve never heard of King Ranch Chicken before. But luckily, I saw your post yesterday. After working late tonight and racking my brain trying to figure out what to make for dinner that would be fast, healthy and delicious, your post came to mind. I made it tonight, and my husband and I loved it! The balance of flavors, creaminess and texture was great. It had just the right amount of heat for my husband — he can take a little, but not too much. Since I didn’t have a lot of time, I used a deli chicken to speed things up. The only thing I’d do differently next time is double the recipe so we have more leftovers! Thanks for another fabulous dish! I’m so glad to hear you enjoyed the recipe, Nena! Thanks for giving it a try and taking the time to report back! I made this last night and YUM! It was delicious and quick, a great combination. I did meed a bit more broth than in the recipe but other than that, ,I made it exactly as written. My husband is already saying that he’s looking forward to the next time this appears in the rotation! Thanks for reporting back, Sandra! I’m glad the recipe was a winner! We recently were treated to some King Ranch Chicken at a neighbor’s house. I got her recipe and comparing it with yours, I like that you lightened it up a bit. I’ll be making this soon. It is definitely a crowd pleaser! I made this tonight and it turned out very well. Probably a little hotter than we would normally do, however the yogurt helped to keep the temperature down. I didn’t change much and will definitely make it again. Thanks again for the excellent recipe and instructions. Roddy, thank YOU for taking the time to leave a review! I’m happy to hear you enjoyed the recipe. Tasty recipe with a kick! Thanks for sharing! Thanks for sharing this review, Ana! I’m glad it was a winner! Hooray! I’m glad it was a winner, Jess. Thanks for taking the time to report back! I made this for dinner last night and it was delicious! I left out the jalapeño and poblano peppers – knowing it would be too spicy for my little one – and it was the perfect amount of spice for my family! Thank you for another easy, quick, delicious, healthy recipe that I’m proud to prepare for my family! Trina, thanks for taking the time to share this review! I’m glad you enjoyed it.